A particular feature of this CD-ROM is the ready access to the available information. 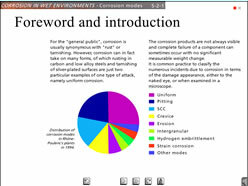 The contents of the Corrosion Treatise are described in an interactive summary that enables rapid identification of topics of interest among the different subjects covered. Each of the many sections is organised around a specific theme, with texts, figures and illustrations harmoniously arranged for easy and pleasant consultation. The figures and illustrations can be displayed in full screen mode. Vocal comments emphasize important ideas or draw attention to details in a photograph. By clicking on words in blue, other windows can be opened to obtain more detailed information. Links between screen pages in the Corrosion Treatise and Case Studies Library enable navigation between theory and practice in a single click. Navigate from one screen to another using the previous / next arrows. Access to the expert text, link to the corrosion cases of the Cases Library in connection with the subject of the chapter. Additional buttons allow you to jump directly from one chapter to another.